The aim of this study was to evaluate the results of focused assessment with sonography for trauma (FAST) in hemodynamically unstable blunt traumatized patients and to determine its role in the diagnostic evaluation of these patients. The emergency physician faces significant clinical uncertainty when a multiple trauma patient arrives in the emergency department. Patients are assessed, and their treatment priorities are established in the primary survey. FAST is an important skill during trauma resuscitation. The use of point-of-care ultrasound among the trauma team working in the primary survey in emergency care settings is lacking in Menoufia university hospitals. This study was conducted on 50 patients with blunt abdominal trauma, either a localized trauma to the abdomen or a polytrauma with a blunt mechanism. The patients were assessed in the primary survey using the FAST as a tool to determine the presence of intra-abdominal collection. There were a total of 50 cases, and FAST scans were performed in all cases. The sensitivity and specificity were 92.6 and 100%, respectively. The negative predictive value was 92%, whereas the positive predictive value was 100%. The overall accuracy was 96%. FAST with presence of free fluid intraperitoneal without reference to the amont is useful as the initial diagnostic tool for abdominal trauma to detect intra-abdominal fluid in hemodynamically unstable patients. FAST performed by clinicians detects intraperitoneal fluid with a high degree of accuracy. All FAST examinations are valuable tests when positive. However, ultrasound examination is operator dependent, and FAST scan has its own limitations. For negative FAST scan cases, we recommend a period of monitoring, serial FAST scans, or further investigations, such as computed tomography scan. Blunt abdominal trauma (BAT) is a common reason for presentation to the emergency department. Unfortunately, patient history and physical examination often lack the necessary sensitivity and specificity to diagnose acute traumatic pathology accurately . Diagnostic peritoneal lavage (DPL) was historically used to determine which patients needed exploratory laparotomy, but DPL is difficult to perform in pregnant patients, cannot be used for serial assessment, and is overly sensitive, which leads to a high negative laparotomy rate . Abdominal computed tomography (CT) has better specificity compared with DPL for intra-abdominal injury in BAT. However, it can be difficult to perform in hemodynamically unstable patients, is expensive, requires removing patients from the clinical area, and may be relatively contraindicated in pregnant patients . Focused assessment with sonography for trauma (FAST), however, is an important and valuable diagnostic alternative to DPL and CT that can often facilitate a timely diagnosis for patients with BAT ,,. The advantages of FAST are as follows: it is noninvasive ; it is safe in pregnant patients and children as it requires less radiation compared with CT ; it can be integrated into the primary or secondary survey and can be performed quickly without removing patients from the clinical area ; it helps to accurately diagnose hemoperitoneum ; it helps in assessing the degree of hemoperitoneum in BAT ; it can be repeated for serial examinations ; it decreases the time to diagnosis for acute abdominal injury in BAT ; and it leads to fewer DPLs. In the proper clinical setting, it can lead to fewer CT scans (patients admitted to the trauma service and to receive serial abdominal examinations) . 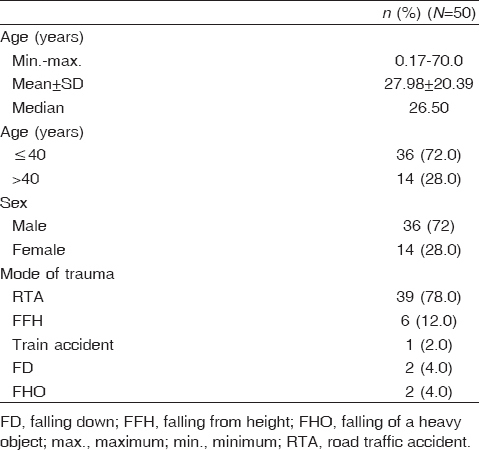 This study was conducted on 50 patients of both sexes and variable age groups with a history of blunt trauma to the abdomen either as a multiple trauma or a localized trauma with a presentation of hemodynamical unstability. Primary survey was carried out for all patients by the emergency physician by maintaining a patent and the airway was secured with the application of high-flow oxygen, and then examination of breathing was carried out by means of inspection, palpation, percussion, and auscultation. Thereafter, pulse oximetry was applied for the assessment of circulatory blood pressure, heart rate, and capillary refilling, and urine output data were collected. Clinical examination of the abdomen was carried out by means of inspection, palpation, percussion, and auscultation of audible intestinal sounds and using FAST as an adjunct in the primary survey, followed by examination of the pelvis and long bone for unstability and fractures. The starting probe position when looking for Morison's pouch should be the anterior axillary line in the seventh to ninth intercostal space. The probe marker should be pointing to the patient's head. To obtain a good view of the entire recess, the probe can be moved toward the head and then back toward the feet along this plane. The starting probe position when looking for the splenorenal recess on the left should be in the posterior axillary line in the fifth to seventh intercostal space; the marker should be pointed toward the patient's head. The starting position of the probe when examining the pelvic region is the transverse position (probe marker to the patient's right) on the symphysis pubis. The probe is angled toward the patient's feet. This part of the examination can be carried out before the bladder is emptied by means of catheterization, and if the patient was already catheterized, the accuracy of the study can be increased by instilling saline into the bladder until it is easily visualized using ultrasound. Examine for fluid posterior to the bladder, posterior to the uterus, and between loops of bowel. Once the bladder is identified transversely, rotate the probe ninety degrees for the longitudinal view by tilting the probe to the right and to the left to assess the sides of the bladder. For the FAST subxiphoid view, position the probe almost flat on the abdomen with the marker to the patient's right and angle the probe to the patient's left shoulder. The primary survey was completed with the assessment of disability using the glasgow coma score, pupil examination, and signs of lateralization. The survey was finished by detecting sites of external bleeding. Data were collected and compared with the formal ultrasound results performed by the radiologist and with the results of exploratory laparotomy. The data collected were tabulated and statistically analyzed using SPSS statistical package (SPSS, V17; SPSS Inc., IBM, Chicago, USA) on IBM compatible computer (IBM). In the following sections, continuous variables are expressed as mean and SD after checking for normality of distribution. Differences between baseline and follow-up findings were analyzed using the paired sample t-test. A P value of 0.05 was considered statistically significant. 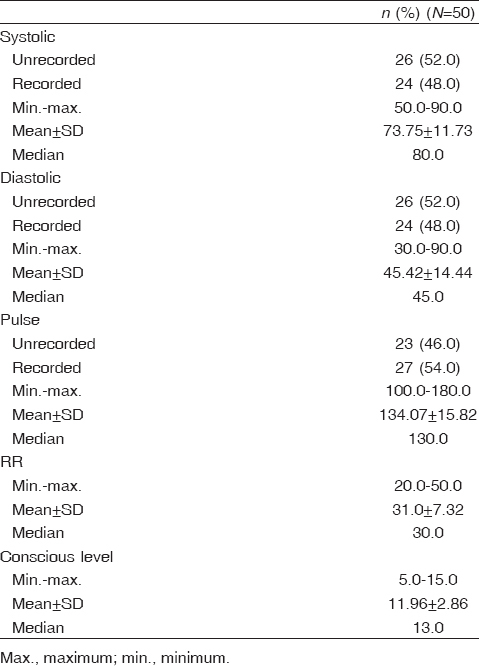 The validity of FAST results in comparison with formal ultrasound results performed by the radiologist revealed a sensitivity of 92.6%, specificity of 100%, positive predictive value of 100%, negative predictive value of 92%, 0.0% false-positive rate, 7.4% false-negative rate, and accuracy of 96% [Table 10]. BAT is regularly encountered in the emergency department. The lack of historical data and the presence of distracting injuries or altered mental status, from head injury or intoxication, can make these injuries difficult to diagnose and manage. Victims of blunt trauma often have both abdominal and extra-abdominal injuries, further complicating care . FAST is a rapid, repeatable, noninvasive, bedside method that was designed to answer one single question: whether free fluid is present in the peritoneal and pericardial cavity. It has been a valuable investigation for the initial assessment of BAT ,,. Mishra et al. from India reported a sensitivity of 91% and a specificity of 100% in identifying fluid by radiologist in blunt trauma abdomen, whereas other studies reported a sensitivity of 100% and a specificity of 97.5% among nonradiologists and 95.8% sensitivity and 97.5% specificity among radiologists. Positive predictive value among normal range and relative risk were 88.8 and 88.46% and negative predictive values were 97.5 and 99.15%, respectively ,,. In our study, the sensitivity was 92.6%, specificity was 100%, positive predicted value was 100%, negative predictive value was 92%, false-positive rate was 0.0%, false-negative rate was 7.4%, and accuracy was 96%. Limitations of a negative FAST examination have been recognized , and a negative FAST should be repeated at an interval of 6 h . Patients with a negative scan were observed clinically and none of this group developed abdominal-related complications. In our study, negative FAST was repeated by a radiologist at an interval of 2 h with two positive cases. There are different causes of false-negative FAST. For example, acoustic shadows from ribs will obstruct a clear view of Morison's pouch and an empty bladder will limit the evaluation for free fluid in the pelvis. Patient habitus and subcutaneous air also degrade image quality . Development of hemoperitoneum over time, can make it difficult to detect injuries with slower bleeding using the ultrasound. Hence timing may be more responsible for the discrepancy in this patient compared with imaging modality because of ongoing bleeding and active fluid resuscitation in the interval between FAST and follow-up ultrasound after 2 h .
For negative FAST scan cases, we recommend a period of monitoring, serial FAST scans, or further investigations, such as CT scan. American College of Surgeons. Advanced Trauma Life Support. http://https://www.facs.org/quality-programs/trauma/atls. [Last accessed 2015 Apr 04]. Jansen JO, Logie JR. Diagnostic peritoneal lavage – An obituary. Br J Surg 2005; 92:517–518. Griffin XL, Pullinger R. Are diagnostic peritoneal lavage or focused abdominal sonography for trauma safe screening investigations for hemodynamically stable patients after blunt abdominal trauma? A review of the literature. J Trauma 2007; 62:779–784. Bahner D, Blaivas M, Cohen HL, Fox JC, Hoffenberg S, Kendall J, et al. AIUM practice guideline for the performance of the focused assessment with sonography for trauma (FAST) examination. J Ultrasound Med 2008; 27:313–318. Korner M, Krotz MM, Degenhart C, Pfeifer KJ, Reiser MF, Linsenmaier U. Current role of emergency US in patients with major trauma. Radiographics 2008; 28:225–242. Isenhour JL, Marx J. Advances in abdominal trauma. Emerg Med Clin North Am 2007; 25:713–733. Kirkpatrick AW, Sirois M, Laupland KB, Liu D, Rowan K, Ball CG, et al. Hand-held thoracic sonography for detecting post-traumatic pneumothoraces: the extended focused assessment with sonography for trauma (EFAST). J Trauma 2004; 57:288–295. Helling TS, Wilson J, Augustosky K. The utility of focused abdominal ultrasound in blunt abdominal trauma: a reappraisal. Am J Surg 2007; 194:728–732; discussion 732–733. Dossett LA, Riesel JN, Griffin MR, Cotton BA. Prevalence and implications of preinjury warfarin use: an analysis of the National Trauma Databank. Arch Surg 2011; 146:565–570. Moshiro C, Heuch I, Astrøm AN, Setel P, Hemed Y, Kvåle G. Injury morbidity in an urban and a rural area in Tanzania: an epidemiological survey. BMC Public Health. 2005; 5:11. Demircan A, Keles A, Gurbuz N, Bildik F, Aygencel SG, Dogan NO, et al. Forensic emergency medicine – six-year experience of 13823 cases in a university emergency department. Turk J Med Sci 2008; 38:567–575. Mishra B, Sinha Mishra ND, Sukhla S, Sinha A. Epidemiological study of road traffic accident cases from Western Nepal. Indian J Community Med. 2010; 35:115–121. Dolich MO, McKenney MG, Varela JE. 2576 ultrasounds for blunt abdominal trauma. J Trauma 2001; 50:108–112. Sloan JP, Lalanda M, Brenchley J. Developing the role of emergency medicine ultrasonography. The Leeds experience. Emerg Med J 2002; 19:A63. McKenney MG, Martin L, Lentz K, Lopez C, Sleeman D, Aristide G, et al. 1000 consecutive ultrasounds for blunt abdominal trauma. J Trauma 1996; 40:607–612. Gaarder C, Kroepelien CF, Loekke R, Hestnes M, Dormage B, Naess AP. Ultrasound performed by radiologists-confirming the truth about fast in trauma. J Trauma 2009; 67:323–329. McKenney M, Lentz K, Nunez D, Sosa JL, Sleeman D, Axelrad A, et al. 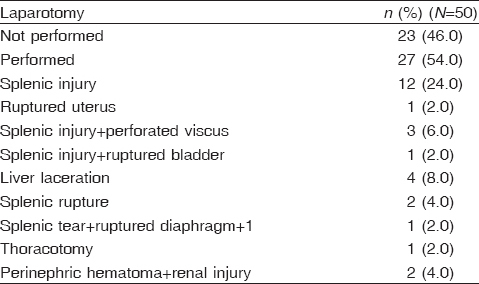 Can ultrasound replace diagnostic peritoneal lavage in the assessment of blunt trauma. J Trauma 1994; 37:439–441. Boulanger BR, McLellan BA, Brenneman FD, Ochoa J, Kirkpatrick AW. Prospective evidence of superiority of a sonography based algorithm in the assessment of blunt abdominal injury. J Trauma 1999; 47:632–637. Maxwell-Armstrong C, Brooks A, Field M, Hammond J, Abercrombie J. Diagnostic peritoneal lavage. Should trauma guidelines be revised?. Emerg Med J 2002; 19:524–525. Ballard RB, Rozycki GS, Newman PG, Cubillos JE, Salomone JP, Ingram WL, et al. An algorithm to reduce the incidence of false-negative FAST examinations in patients at high risk for occult injury. Focused assessment for the sonographic examination of the trauma patient. J Am Coll Surg 1999; 189:145–151.